The week just ended was mostly sideways with volatility (1-2%) up and down. 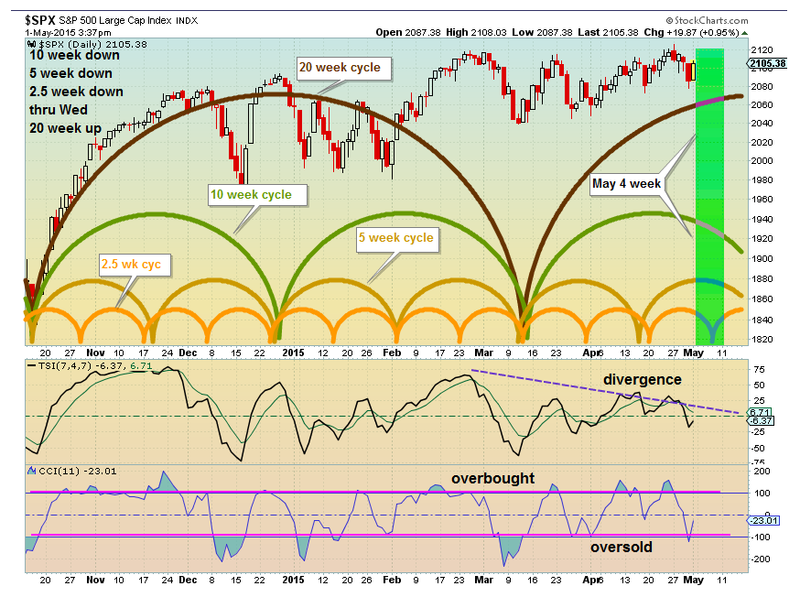 This was much as I posted based on conflicted cycles and indicators. The coming week seems clearer. The 2.5 week (12 TDs) cycle is down thru the first 2-3 days of the week. The 5 week cycle (24 TDs) topped and turns down. The 10 week cycle continues down. The 20 week (Wall cycle) continues up for 2-3 weeks. So to begin the week 3 cycles are down and one up. By mid week the shorter cycle bottoms and turns up. So a notable pull back should be noticeable for the week with a bottom by May 5-6 and sideways to up near the end of the week. TSI continues to diverge (down while market was/is sideways to up). A sign of potential weakness. CCI is slightly oversold. Thursday PM - After market close. Appears that Wednesday may have been mid week bottom I expected. You've had some great calls the past few weeks. Really appreciate the great work you share here! Any insights into the bias of early next week? Not yet, but I suspect we test old highs first of next week. I will try to be more detailed later.